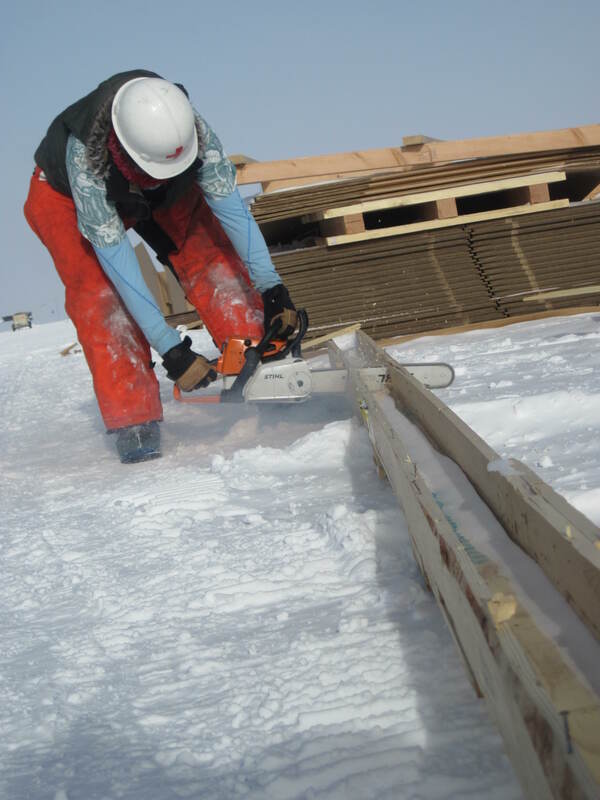 I’ve been getting a lot of requests for info on how to get hired for a position in Antarctica this coming season, and I have great news for you: Bill Spindler has very nicely compiled a page of links with all the subcontractors. If you’ve read anything at all about the hiring, you probably understand that Lockheed Martin is the main contractor, and there are a bunch of subcontractors for different departments. What that means is that there isn’t a streamlined collection of all jobs on one webpage; this is not necessarily a step down though. If you applied through Raytheon during the last contract, you will remember that their webpage kind of sucked. And by “kind of sucked,” I mean that it made you want to gouge out your eyes with a shovel. I can’t speak to how the application process is on most of these sites: the one I applied through was pretty easy. If you’ve already applied, let us know how the experience was for you in the comments section. Here is the abbreviated link list, with companies hiring for on-ice positions. If you have any confusion about what to do or how to apply after you get to a website or why you would even want to go to Antarctica in the first place, just back up a minute and go to Bill Spindler’s website. PAE: Infrastructure and Operations (I&O), Transportation and Logistics (T&L). GHG: On-site Information Technology and Communications (IT&C). Gana-A’Yoo: Food Services, Housing & Janitorial Services, Retail & Postal Services. 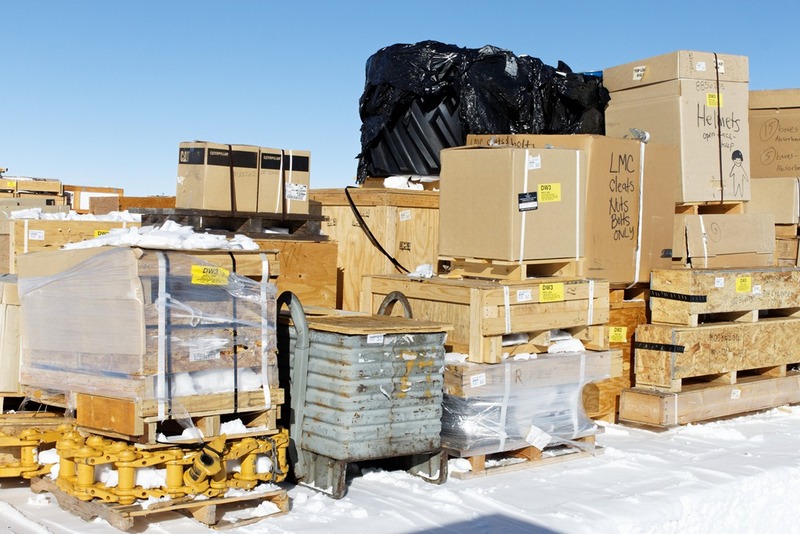 This season I’m working as a Materialsperson, which means basically I work with stuff—and we have a LOT of stuff here at South Pole, warehouses and stockrooms and berms and drawers and airplanes full of it. You can’t get rid of much because if you did, and then someone needed it, it would take two years and a lot of money to get it back. But seriously, a lot of it is junk. South Pole station has a hoarding problem. Anyway, we like to keep track of the stuff we have, and we do the best we can given the short season and the high volume of stuff being flown in and going out to work orders. My main project this season has been doing a deep inventory of the C-Berm (one of like 20 berms) which is home to most of the Heavy Shop and Power Plant stuff, as well as Fuels, IT and the greenhouse. To give you an idea of how screwy this berm is, our database, MAPCON, lists about 1000 different kinds of machine engines, CAT track shoes, bolts, cylinder heads, coaxial cable, fuel hoses and other things like that. After taking EVERYTHING off this berm, opening many and recounting all of the crates, researching their contents and shipping documents, putting everything back on, mapping and recording and crosschecking it, I discovered that we are missing 598 kinds of stuff (some of those stock numbers have hundreds of themselves listed in MAPCON but are nowhere to be found). That included three huge engine heaters, two whole snowmobiles and one $92,000 generator for the power plant. It’s not like people put this stuff in their suitcases and took it home, they just used it and didn’t write it down. There are things that do not belong that we found on this berm, including dumbbells for weightlifting, science equipment and 200 pounds of Ramen Noodles from 2003. To do this project, we first removed all of the crates and boxes, setting them aside so the heavy vehicle operators could reform and grade the berm, basically carving a neat, 3 foot tall platform that was fifteen feet wide and hundreds of feet long. 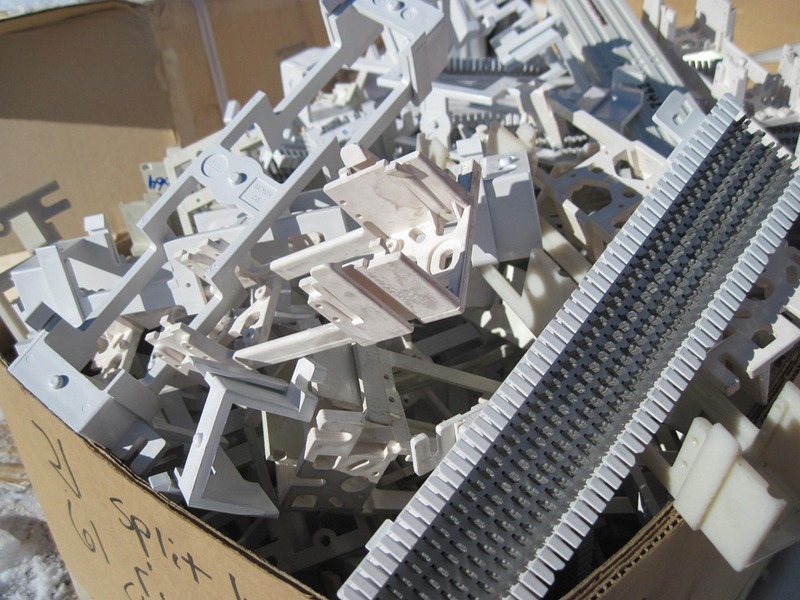 I took away a lot of things that were obviously trash, and parts for vehicles that we no longer have. I opened lots of boxes that had dubious contents, counted, labeled or laughed at the stuff inside, and if we were keeping it, re-banded and crimped it. When it was time to start putting things back on the berm, I can use either a 277 or a 953 CAT loader. The 277 is a responsive, zippy little vehicle that is pretty fun to drive. It operates with a joystick and feels like a really big toy with a rollercoaster-like safety bar, and its name is Emma. 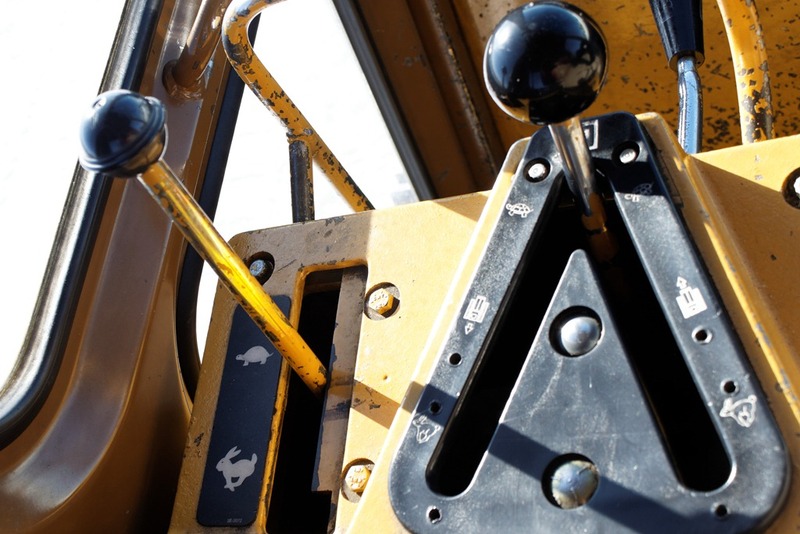 The 953 is a huge loader (well, not huge in the world of loaders, but huge next to Emma) named Sundog, and Sundog is a huge, rickety loader that has two speeds: crawly and jumpy (also stabby, as in stabbing boxes with the forks, but that’s not really a speed). I used whichever loader was available, and sorted and stacked the things into categories as well as I could, leaving as little space as possible to prevent snow drifting, a major challenge when next year’s team (maybe including me) has to inventory the whole berm again, although not to quite the extent as this year. I learned a lot working out there by myself, about operating the loaders and the differences between the machines. And then it was done! Now it’s all ready to get completely drifted in over the winter, and then we’ll shovel it out and recount everything next year, although hopefully it will be much, much easier. As you may know, Sundays are our only day off here in Antarctica, and we have to make the most of them. There are all kinds of community-led activities, writing and photography classes, volleyball, soccer, ultimate frisbee, impromptu craft parties and wine tastings in the greenhouse. This Sunday, I went to yoga and spent a while in the sauna before heading for dinner, and Daniel went to the first soccer tournament of the year—soccer players practice a few hours every week, on Wednesdays and Sundays, and it’s a big part of Daniel’s exercise regime, something I remember him telling me on the phone in 2009 when he first came down to the ice. During the game, Daniel had a collision with another player, both men running full speed and focusing on the ball instead of each other. He fell and got up, and finished out the tournament. But when he was still in pain later that evening, we decided to call Medical, even though Sunday is their day off too. Something seemed wrong; it looked like there was at least swelling on the left side of Daniel’s face, if not a maybe-different shape than normal. The PA was on call, and after looking for a bit and making sure Daniel wasn’t suffering a concussion or any head injuries, she called in the doctor as well. After poking and prodding and examining and xrays, the prognosis was a broken zygomatic arch, Daniel’s left cheekbone, and he was immediately scheduled for the next flight out. An unresolved fracture is an automatic NPQ (the opposite of PQ, when we are physically qualified to come to the ice at the beginning of each season). That night, we sat together in bed after packing Daniel’s stuff, dealing with his physical pain, regretting this seemingly small accident, and grappling with our mutual feelings about the season having to end like this, but having flashbacks to food poisoning and malaria scares in third world countries and being grateful that here, at least we speak the language and understand the medical system. We decided together that it made the most sense for me to stay and carry out my contract, since I’d be leaving in a week and a half anyhow. And then before I could think straight or even realize this was real, he was on the plane and I was crying on the runway. His two sweet coworkers stood on either side of me as we watched taxi and takeoff, the contrail behind the plane like a physical thing, looking as though the runway itself buckled up to assist the plane’s loft. He is in New Zealand now, getting ready for appointments and maybe a small surgery, and hopefully will be ready for a real vacation in about a week when I get back. I miss him a lot, and it feels weird and hollow and different to be here without him in this big, cold bed, but I know that this is the best way to have a medEvac; finish your soccer game, pack your own bags, walk yourself unescorted onto the plane, and be ready for a kiwi roadtrip in a week. And I know it could have been so much worse, so I’m grateful for that. And I’m grateful for the community response to this, the support I’ve gotten, the off-ice medical and insurance help that Daniel is and will be getting, and the hugs and offers for help packing and airplane bag lunches from friends. I’m even more ready to go, now that work is getting frantic with things to finish before station close and people, including me, are dirty and cranky and just over being here. The funny thing is though, I know we want to come back. So here’s to fast healing and minimal pain, to friends who stand beside you when things go wrong, to the end of this season, and perhaps to the beginning of the next one. A few days ago I did a live chat with two classes of 3rd graders in St. Paul who are learning about Antarctica. To prep for the Q&A, their teacher Mitchell told me, they played with mint-breath cold winds, made eyewear to ward 24 hour daylight rays, played sightless/wordless blizzard rescue, and made models of the Gamburtsev Mountains which they later covered with handmade snowflakes. They had some really good questions! Check ’em out! Shekina asks How was your breakfast? me: Hi Shekina! I haven’t had breakfast today, but I normally have fresh eggs when they are available–they have to be flown in from New Zealand, a country near Australia. I think that makes them taste special. Griffin: Have you ever fell through the ice? me: I did fall through the ice once–I was shoveling near the small aircraft landing pad last year and I fell into a 12 foot hole. Luckily there is no water here at South Pole, so I landed on top of a buried building, not in the ocean. Charlie: Have you ever gotten lost? me: No, we stay pretty close to the station most of the time. I got a little lost the first time I tried to find my bedroom, but not scary lost. Imani: What is your favorite thing to do there? me: I like to play games, dance, make art and exercise on my days off–we have one day off a week, Sundays, and we have to spend it wisely. My favorite thing would be hard to choose! Mandeq: Do you ever see animals at Pole? me: Not normally, since we are 800 miles away from the coast and there is no food or water for animals here. When the over ice traverse came in (like a tractor road trip that brings us fuel) a BIRD came with them! It was so crazy to see a living animal here–they announced it over the intercom so everyone could look. Gunnar: How cold is it there now? me: Right now it is -23 F with a windchill of -47 F.
Tyler and Qiana: Have you ever ridden/touched a polar bear? me: I wish! That would be so cool. We don’t have polar bears in Antarctica, though, they live in the northern hemisphere. Addie: have you ever gotten stuck in the snow? 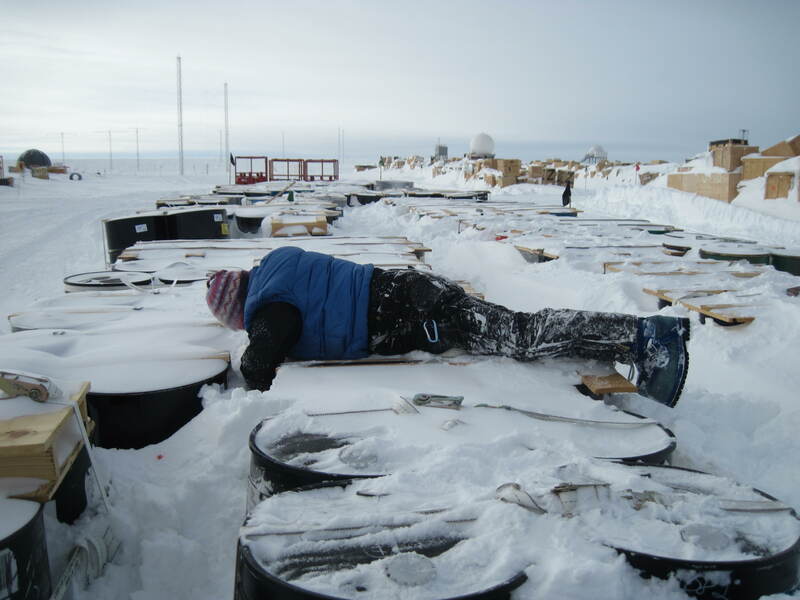 me: Not STUCK stuck, but sometimes it can be really hard to walk in deep drifting off station–you would lose your boots if they weren’t tied on! Melissa: Do you stay warm in your cold gear? me: Yes, they give us plenty of warm clothing–jackets, snowpants, boots, long underwear, fleece pants, mittens, neck gaiters. Sometimes I get cold when I work outside for a long time, but not too cold normally. Austin: Ever seen an iceberg? me: I have seen sea ice from the plane into McMurdo station (on the coast) but I don’t think I’ve seen an iceberg. Amir: What is the hardest thing to do there, in your opinion? me: Good question.. I think the hardest thing we do (in terms of work) might be the jobs of the people who defuel the airplanes–they work outside all day every day, and the planes are really loud, they have to carry heavy fuel hoses around, and they smell like stinky fuel. Anna: Whats the highest temperature since you’ve been there? me: Actually, we hit a record this year–it got to TEN degrees above zero. It felt so warm! Sasha: Is it ever warm in your room? me: It depends on the room. This year my room is so warm I can’t even wear socks to bed. Last year, in another room, I had snow on my bed sometimes, because it would blow in through the cracks!!!! Georgia : Is the Jamesway comfortable? me: It can be. I like my room a lot this year. It can get a little stinky though, because we are only allowed to shower twice a week to save water, and lots of people don’t have doors, only curtains. Mitchell: from the class – what are you doing today? Mrs. Voglegesangs 3rd grade class says “Thank you”!!!! me: Well, today I am going to unpack a bunch of frozen food that we have stored outside (everywhere is like a big freezer) and we are going to prepare food for the winter. Thank you all!! Nice to meet you! Mitchell: How do you prepare food for the winter if it’s already frozen? me: Well, we are stocking it so they can access it. 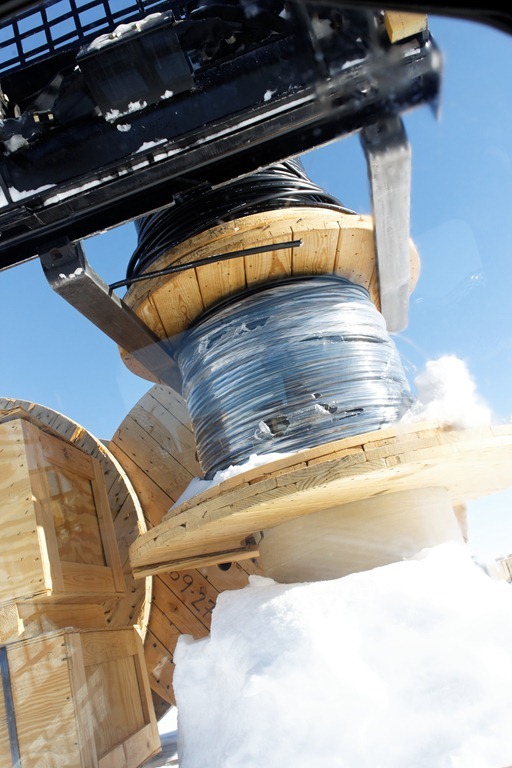 It stays outside in the summer, and we need to move it with tracked loaders because the containers are thousands of pounds each– we unpack it and keep it in inside frozen storage because the tractors freeze in the winter and we can’t use them. Mitchell: back in the other class, Hello! 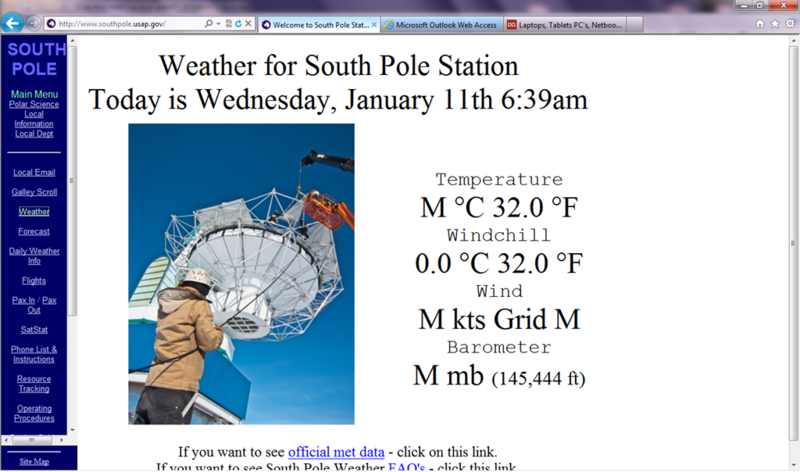 me: hello from south pole station! Cedes: How cold has it been lately? Adam Me. : Seen any polar bears? me: Unfortunately, no! Polar bears live in the Northern Hemisphere, they don’t come all the way down here. Maybe I’ll see one someday if I ever go to the north pole. Emily: How long have you been at the South Pole? me: I have spent eight months here total–four months last year, and almost four months this year–since October! Eddie: What do you like about the South Pole? me: I like a lot of things, but mostly I like the people who I work with, getting to be outside,and getting to see the sun 24 hours a day. Josh Wo. : What jobs do you do there? Kenisha: Do you like sleeping in the tents (Jamesways)? me: Some times I like it a lot, other times it’s no fun to go outside in the sunlight and cold to brush my teeth before bed–it wakes you up! Quiante: What types of animals live there? me: None, actually! We live 800 miles away from the coast and Antarctica is technically a desert, so there is no food or water for animals. We have to melt ice for people to drink, and all our food comes on airplanes. Charlotte: What is your favorite activity for fun? me: I like dancing–we dance every weekend here! Josh Wa. : When did you first go to Pole? me: My first time was October of 2010. But the first person to ever get here was 100 years ago, a Norwegian named Roald Amundsen. Celia: If you could, would you live there year round? me: I want to spend a full year here sometime, and to see the winter and the 6 month night. I think it would be really cool. You can only be here for a year at a time though. me: I haven’t slept in a trench myself, but my friends have! No one has had theirs cave in, at least not this year. Chloe: How many people live there? me: In the summer (now) there are about 250 people–scientists and the people they need to support them, like me. In the winter, there are about 45 people. Ella: Is it comfortable to wear all your snow gear? me: It’s pretty bulky–it can be hard to get in and out of vehicles, go up stairs or work (like shoveling!) Lots of us bring our own jackets since they are more comfortable. Connor: How long did it take to get there? me: A few days– from Minneapolis we fly to New Zealand–about 20 hours of flights. 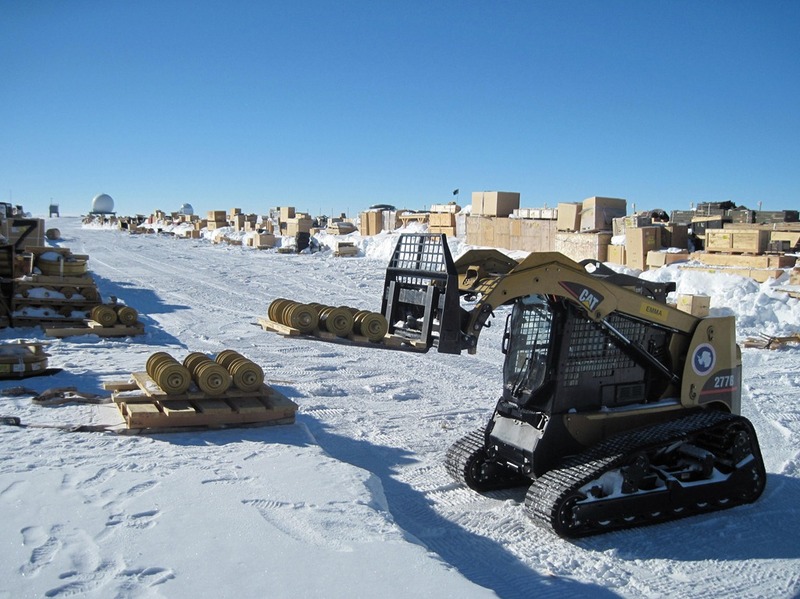 From NZ to McMurdo is 5 hours, then to South Pole is 3 hours’ flight. Sandy: What’s the biggest hill you’ve slid down? me: Ob Hill in McMurdo is really tall, like a mini mountain! I climbed up that and slid down on my bottom. It was fun, and fast! Grace K.: Is the bed you sleep on soft or hard? me: Pretty soft, but sort of old. Like summer camp. Tess: Do you get scared during the blizzards? me: It can be sort of unnerving to not be able to see the station, but I have a radio on me so if I was ever lost I could call for help. Kara: Is it hard to be out in the cold that long? me: Yes, very. Working outside is a very challenging part of my job. Alaysia: How do you break the ice? me: Well, to get ships to McMurdo for food, they have a special ocean vessel called an icebreaker. 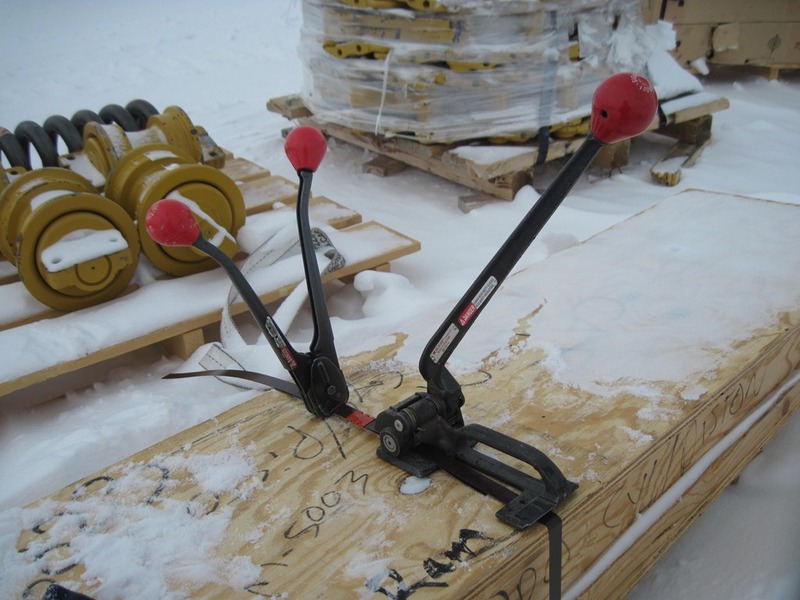 For things on station, we use shovels and icepicks and other tools. Zoe: Can you go skating there? me: The ice we live on is like packed snow, so not really unfortunately. Will: What kinds of food do you eat? me: We eat normal food, like from a cafeteria–sometimes we get fresh vegetables, which is really exciting and we have a small greenhouse to grow our own veggies. But we have things like hamburgers and soup and cereal, or more exciting things sometimes, like Thai food. Mitchell: Kiell, thank you for responding to our questions and spending time with us! What about you? Do you have any questions for me? Yesterday at work, I was receiving and stocking housing materials including a box of 100 plastic footstools, and I couldn’t figure out how to reach the top shelf I needed to place them on. That’s how I know it’s time to go. Last month in anticipation of the centennial, Norwegian reporters roamed the station, trying to distill the South Pole Living Experience into a paragraph or two. 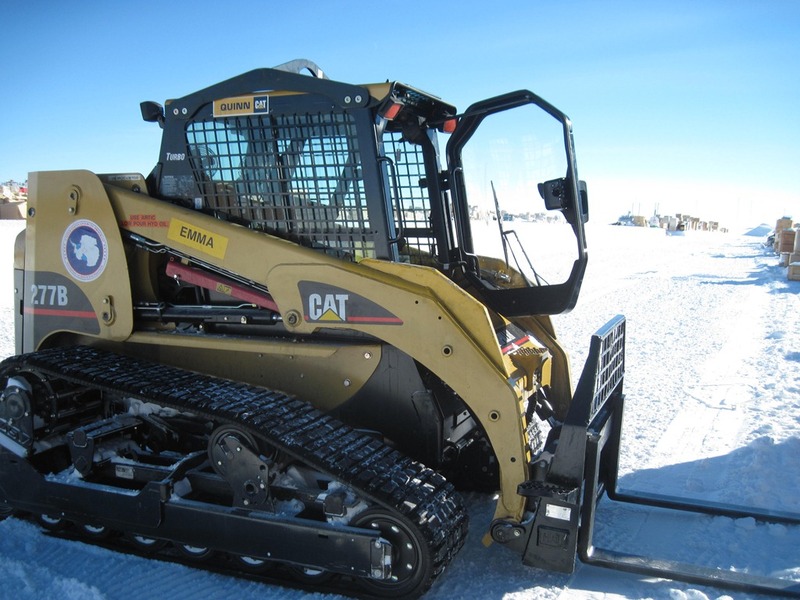 While I was out inventorying the C-Berm, on my hands and knees in the ice, burrowing into snow drifts to count yellow-paint-peeling-in-the-sun CAT track grousers, one one of them approached me, wanted to ask me a few questions. “Why do you come here?” he asked. At first I didn’t know, and I mumbled some half-assed speech about the people, about being with the people who come here, which he interpreted as, “So you like the night life?” …Well, not exactly, but I didn’t know how to explain it. He took my picture with a used 953 fuel tank and a box of bolts, and moved along. But I’ve been thinking about the answer ever since. I come here because of the interesting people, really. Not the night life, but to be with people who are living their lives however they want, and seeing whether they are happy with that, or not, and why. Traveling, adventuring, falling in and out of love and getting frostbite and shoveling; biking a hundred miles a day in Maine and motorcycling across Southeast Asia, partying like maniacs in Brazil or Miami, and then driving their pickup truck all down South America through cities and jungles and drug lord territories, because they want to. Because they are here to study the cosmic microwave background and the birth of the universe and neutrinos and to capture the cleanest air in the world for science. Because people have little patchwork businesses at home that they sustain themselves with, carpentry and teaching yoga and fixing people’s cars; because people have been to every continent whether to fight in wars or to save people’s lives through volunteer medical work; because their kids are grown and they wanted to do something different. I come here because it frames my whole life from a totally different perspective, because it makes me appreciate little things I can’t have, like baths and candles and grass and puppies, decent beer and coffee and a place to cook my own food, bodies of water and mountains and trees. It makes me appreciate things I don’t like, like a commute to and from work every day which is a time to be alone with my thoughts, and a time to separate my work life from my home life (rather than a few flights of stairs from my office to the galley where people ask me about work at breakfast, lunch, dinner and parties). It makes me appreciate my family and friends even more, because although the people here are living amazing lives and while I love some of them, I don’t choose them. I come here because it gives me a chance to learn things in ways I couldn’t learn them at home; every little thing, like writing on a piece of paper, becomes a struggle of mittens and wind and cold, sluggish hands and paper like a kite. And because of more substantial hurdles, like trying to learn a language or playing a violin or running despite the altitude. Because I have the opportunity to defuel military planes and blow up buried buildings with dynamite and drive giant vehicles, things I might never fall into at home. And, well, because it sounds interesting. Even though sometimes while I’m here I question why I ever agreed to this insanity of a lifestyle, I came back this year because as soon as I left I missed Antarctica, and because when I thought I might not be able to come back because of the icebreaker situation this summer, I was devastated. Because even though my lips are now so chapped and peeling that they feel like they’re growing hair, and even though my body is screaming for vegetables and warm sun and more sleep and long showers, I still want to be here, to be a part of this. I want to spend a winter here, to see the sun go down for six months and see the moon go up and stay down for two weeks at a time, to feel what 100 degrees below zero is like, to see the aurora australis in all of its shimmery splendor. Why do I come here? I don’t exactly know, honestly. I came here in the first place because it fascinated me, and I came back because I liked it. Tuesday, a much quieter centennial than the one last month, we marked the 100 year anniversary of Robert Falcon Scott’s arrival here at South Pole. His team, a few days earlier having seen the first sure signs they were not the first to arrive at the Pole, came to the pole to discover a tent and a letter left by Amundsen over a month before. 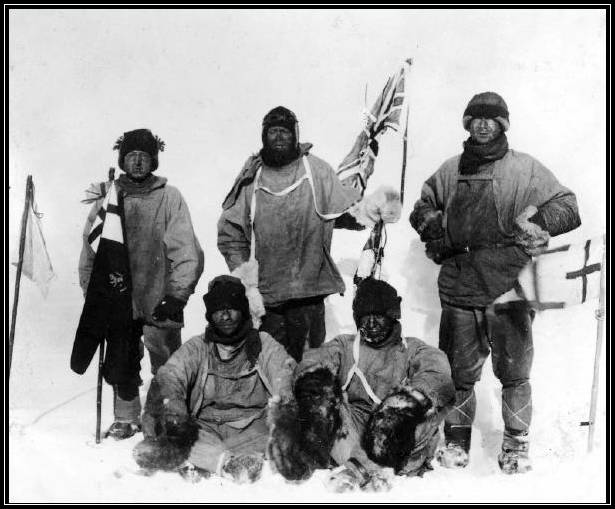 What I find interesting about Scott’s expedition is the amount of energy they dedicated to scientific exploration—despite dwindling food and hope, they continued to drag with them geological samples: they died on the way home with rocks in their sleds in the name of science. It’s been a whirlwind weekend, starting on Friday when a friend and I held a barn dance in the gym–not the best location for ambiance perhaps, but we thought since it was a work night it was best to have it on in the elevated station so station-dwelling folk would be more likely to attend. We did a grand march/snake dance through the galley, the science labs, the meteorology office and the lounges to try to recruit more dancers at the beginning (Ed the Fuelie Fiddler played Angeline the Baker and Yamina for us as we went, trailing behind and riling up spectators). We danced Od Lo Ahavti Dai, Savila Sa Bela Losa, Dudlebska Polka, Machar, Miserlou, Margaret’s Waltz, Pata Pata and a new dance I want to teach everyone, called Slap Leather (think cowboy boots), mostly to live music. We polka’d, waltzed and two stepped until the altitude caught our breath and it was time to go, and we mopped up the spilt beer and washed the accumulated gym dirt off our bare feet around 11 at night. The following photos are from SysAdmin Carla Appel, whose blog is at http://carlaappel.blogspot.com/. It was a sweet and powerful highlight of my season so far, and it made me feel happy to be here but so, so homesick at the same time. Last night was the carp shop party, held in the carpentry jamesway, and we danced and stood around the wood-burning grill, trying to avoid the wicked wind, warming our hands and beverages and singeing our hair. In Antarctica, you need a beer koozy to keep your beer from freezing and to protect your hands. There were yard games like bocce ball and washers, and a cute little photo booth that the carpenters built, attached to the side of the jamesway. As we walked home, only a short distance, I think I might have gotten a bit of frostnip from the wind, which was dumb. Lesson learned: always wear a hat. Unrelated, earlier this week we attended our redeployment meetings. Daniel and I are both set to leave South Pole on February 9th. We haven’t decided what we’re going to do, but the options for travel are more limited that they have been in past years. We can have a free layover in Honolulu or LA, or pay $100 each plus a visa for a layover in Sydney. There is no option for travel credit (putting the cost of your ticket towards a different ticket) which is what we did last year when we flew to Cape Town, which is too bad. We have discussed taking a side trip to visit Thailand again, or maybe some travel in Australia, but then we’ll go home. In the spring, we’re hoping to get back to Scandinavia, Iceland, Finland, Denmark and Norway if possible. And then, if we still have any money, we’ll travel in the US until it’s time for Family Camp in June and work in July. We’ll see what happens after that, but we still don’t have a solid idea of what hiring will be like for next year. We’re getting little bits of information here and there, and we know that there are a lot of subcontractors to Lockheed so we will be applying with different companies. We do want to come back if it’s possible. What was just a one year lark of an idea seems to be becoming a little career… I like the change twice a year, as much as I miss home. I don’t expect we’ll do this forever, but it’s working for us now. Does this mean we’re in space? Whoa…check out the physiological/barometric altitude (and the “temperature,” for that matter). 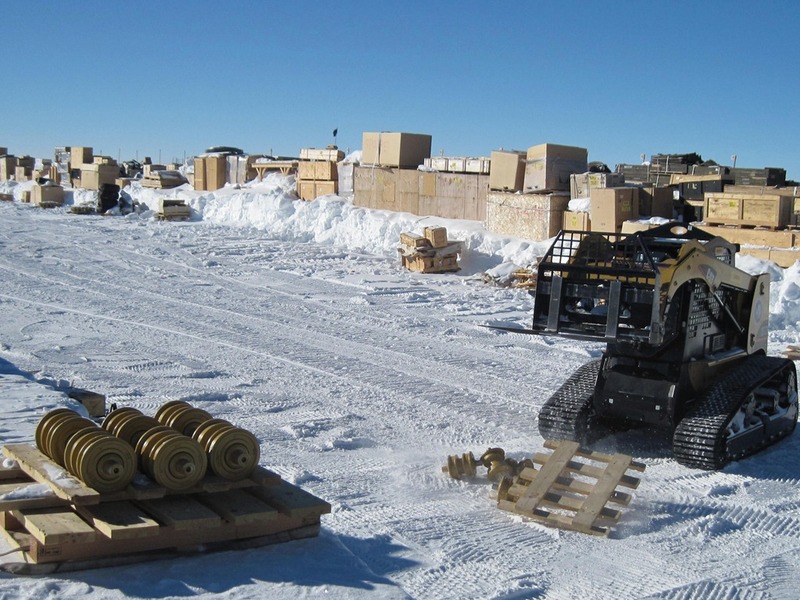 About those snow boulders from the last post… they were put there by Fleet Ops night shift (I think): they have to have been placed by loaders. Either that or aliens. And when they get cleared, they get spread out downwind of station in the sector known as the End of the World. Snow gets bulldozed all season, piled up in all sorts of places, dumped into a big metal vessel called White Trash, and dumped where it won’t blow back. 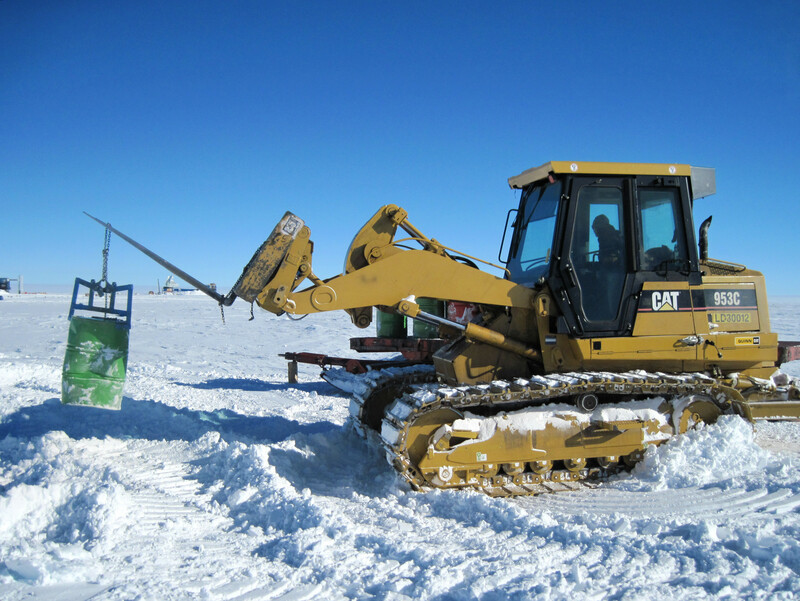 This is a never-ending process; Fleet Ops is here plowing all summer season long. I can hear them right now. Last week there were no less than four loud, geriatric tracked loaders clattering and rumbling and shivering outside my canvas wall as I tried to go to sleep one night. It’s hard here because the work has to be done, loud as it is, and there are people sleeping in shifts around the clock, both on station and in summer camp. But the boulders were just for fun!